The Tornado is a revolutionary new product that incorporates incapacitating pepper spray, an ear-piercing 125dB alarm and a blinding strobe light into one personal defense system about the size of a cell phone. Click on the Links Below to Watch how the Tornado System & Accessories Work! Protect Yourself...Protect Your Loved Ones! It is lightweight and easy to use, and can be accessed and deployed in about one second. 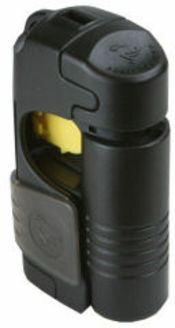 A single button releases the unit from the base and automatically activates (in less than one second) the alarm and strobe, calling for help and blinding the attacker. The Tornado personal defense system discharges eight one second bursts of pepper spray up to a distance of 15 feet, and with the built in finger lock you always know the unit is pointed in the right direction (so you can't spray yourself). The unit measures three and one-half inches x two and one quarter inches. It requires 2 CR2032 button batteries that are included. A free belt clip and lanyard are included with each unit purchased.